About a week ago, our office was discussing the age target of a potential client that we’re speaking with. The client sells boutique women’s clothing at a low-to-mid price range. We agreed that teenagers were most likely the targeted audience. After a little digging into their data through Shopify’s profile data and Google Analytics demographic data, we discovered that a majority of purchases made were from women in their early 20’s. 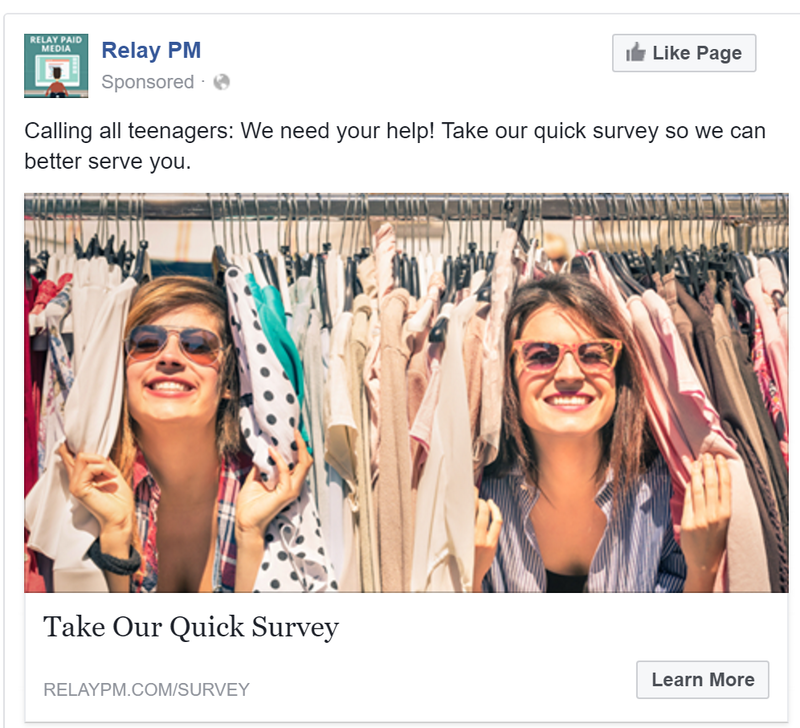 This led to another question: If the website is targeting teenagers, but women in their early 20’s are the primary buyers, then are teenagers still primarily shopping at brick and mortar locations? We needed answers fast with quantifiable data. Our Social Media Manager suggested that we post a survey on Facebook. After doing a little more research, we discovered Survey Monkey. Within about 30 minutes, we created a couple Facebook ads and had everything up and running. We didn’t know what to expect with engagement and survey completions (since we didn’t offer an incentive to fill it out), so we started two campaigns (one targeting Facebook, one targeting Instagram) at a daily budget of $8. Our goal was to maximize clients, target the 13-18 age demographic, and leave the rest open for Facebook’s algorithms to optimize our reach. Simple right? For $75 we acquired some real actionable data for our potential client. These simple surveys provide endless potential. If you already have a large fan-base to work with, you can acquire valuable data at no cost to you. Survey Monkey provides the code to embed your survey anywhere. Our next step is to test whether incentives like “Win a $100 Amazon Gift Card!” would attract enough engagement to drive Cost-Per-Click down to cover the cost. Another benefit is that you would have a reason to collect email addresses for further testing. Stay tuned to see how the results compare! Contact us today if you would like us to help you discover audience insights through surveys. Newer PostNo More Ad Text Character Limit On Facebook?